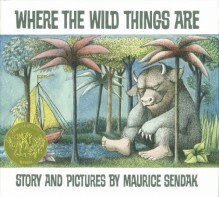 Where the Wild Things Are is a timeless classic that features the infamous home, away, home story. The main character, Max, gets into mischief throughout the day and finally his mother has had enough, so she sends him to bed without any dinner. While enduring his punishment his room turns into a forest and he travels by boat to where the wild things live. Max becomes king of the wild things but he still feels something missing. In the end, Max misses his family and returns home to a hot meal waiting for him. Throughout this story, there are many events that can be used to explain cause and effect. Making a "T chart" activity sheet would be beneficial to have the students understand the meaning of these. Also, this story includes great vocabulary, so a mini vocabulary lesson would be beneficial before reading the text. 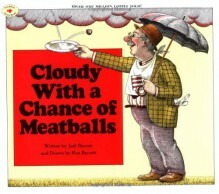 Cloudy with a Chance of Meatballs may seem like a silly text to discuss weather, but reviewing the different types of weather would be beneficial. This story by Jodi Barnett, includes vivid words that paint a picture in the readers mind and incredible illustrations. The story is essentially a grand father telling his grandchildren a fictional bedtime story about a town named Chewandswallow. Chewandswallow is quite the town because instead of rain, snow, or ice, food pours from the sky instead. The town does not have super markets where the residents can buy groceries, instead they rely on their meals to come from the sky. After a storm brews in the city, the residents must find a way out of the city and find a new place to call home. With this book, you could also use it as an example of how to over come challenges and think outside the box. This text is most appropriate for second and third grade readers. On the Lexile Leveling system this book is a 730L. Bud, Not Buddy is a wonderful resource to use in the classroom. This book would be great because it is from the point of view of a ten year old boy who is living in the Great Depression. Bud, is left homeless after his mother dies and is placed in an orphanage. Unfortunately, this orphanage is not the best place to live and the foster home he is placed in is much worse. After sleeping in a shed to being beaten by his foster brother, Bud finally has enough of the abuse and sneaks away. He begins on a journey to find his "father" and along the way has quite an adventure. In the end Bud finds peace with his final home and can at last feel safe. Using this in the classroom would be quite easy especially when interesting a young, reluctant reader. Introducing the Great Depression and discussing Hoovervilles would incorporate history into literacy as well. During reading and language arts the class could discuss the elements of the story and correct spelling of words used in the text. Since this story is from the point of view of a ten year old, this would be easy for the students to read on their own and also keep them interested. 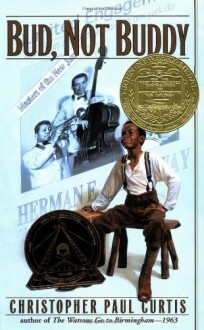 In my opinion, Bud, Not Buddy should be an great read for a fifth grade student. Bud, Not Buddy is a 950L on the Lexile Leveling system. This is one of my favorites! Currently my daughter is obsessed with this book and I love the story it tells. 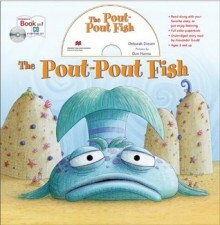 The Pout Pout Fish is definitely a frowny fellow, who encounters many fish in the sea whom encourage him to turn his frown upside down. He clearly finds himself as dreary and will not change until he meets a certain Kiss Kiss Fish. She plants a kiss on his pout and he finally sees that he is more than a pout pout fish. In the end, he plants a kiss on all those he pouted toward and has a change of heart. This story teaches students that it's all about perspective. You could use this book at the beginning of the year to encourage your students to have a positive attitude in the classroom. It would be ideal to have cheery faced student everyday but some days that will not happen. You could refer back to this book, and remind the class that all it takes is one compliment, smile, or nice gesture to turn a friends frown upside down. This text is leveled at a O according to Scholastic's guided reading scale. Rock Out the First Day of School! 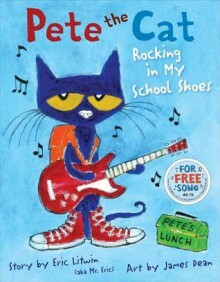 Who doesn't love Pete the Cat? I would use this fun sing song book on the first day of school of course! Shaking off those new school jitters will be so important for those new kiddos. I would use this for lower elementary school, Kindergarten through 2nd grade! Let's rock out the first day! !